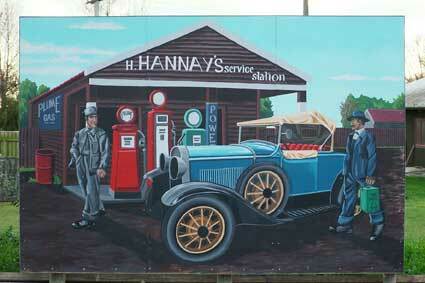 This mural depicts a typical garage in the pre-second world war era. In 1931 the original garage of Harold Hannay &Co. was located in Johnston Street, opposite Francis Street. Hannays decided to re-site their garage and in 1935 they leased a small section, opposite the racecourse, from the council. The lease was two pounds per year. They sold "Big Tree" and "Shell" petroleum products. Hannays operated the garage for 32 years. The large modernised Mobil Service Station now stands on the site.